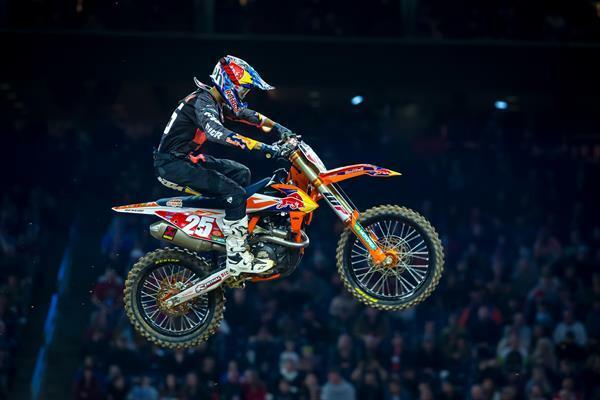 HOUSTON, Texas – Following a stellar performance at the opening round, Red Bull KTM Factory Racing’s Marvin Musquin experienced a tough evening in Houston for Round 2 of the AMA Supercross Championship as he sustained a shoulder injury during 450SX Heat 2 that caused him to sit out of the Main Event. His teammate, Broc Tickle, earned an 8th place finish in only his second official supercross appearance with the team. Additionally, Troy Lee Designs/Red Bull/KTM Factory Racing Team’s Shane McElrath finished 4th place in the 250SX West Main Event. Musquin came into the second round with plenty of momentum behind him after winning the highly-anticipated opening round just one week earlier. The Frenchmen had a good day of qualifying, where he finished 3rd overall in the day’s timed qualifying sessions. In 450SX Heat 2, Musquin didn’t get the best jump out of the gate but he quickly put himself into the top five early on. However, Musquin experienced a crash on lap five that ultimately took him out of the race with a shoulder injury. Despite all efforts to push through, Musquin was not able to line up for the Main Event. Red Bull KTM Factory Racing’s Broc Tickle had a consistent day in Houston aboard his KTM 450 SX-F FACTORY EDITION, finishing 8th overall in the Main Event. Following a 3rd place finish in his heat race, Tickle began the Main Event just inside the top ten. Tickle climbed his way into the 8th place position where he rode steadily to finish out the day in 8th. Troy Lee Designs/Red Bull KTM Factory Racing’s Shane McElrath came into Round 2 with the red plate as he set his sights on defending his championship points lead from a Round 1 victory. McElrath got off to 2nd place start in the Main Event where he battled for a podium position throughout 18-lap race. With about four laps to go, McElrath lost a position to ultimately put him in 4th place for the evening. His teammate, Alex Martin, sustained a small fracture to his right clavicle at the opening round in Anaheim, thus missing Round 2 in Houston.